The screen is not a simple rectangle but rather the homothetic surface of the viewfinder of his camera. It is the very opposite of a frame. The screen is a mask whose function is no less to hide reality than it is to reveal it. The significance of what the camera discloses is relative to what it leaves hidden. On the surface, there would seem few films less illustrative of André Bazin’s point than James Benning’s 13 Lakes (2004). After all, 13 Lakes is no more than what it promises: thirteen lakes (from across the United States) filmed in identical ten-minute takes. Each is a static composition, framing sky and water in equal measure. 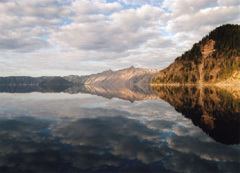 None features any human incursion, save the occasional boat, wave runner, automobile, train and, in the Crater Lake sequence, the off-camera sound of gunshots. This is a film where any human imprint is light and vanishing. Surely, 13 Lakes is a far cry from the principle subject of Bazin’s formulation, Jean Renoir’s multi-character magnum opus, La Règle du jeu (1939). In this classic tragicomedy detailing the peccadilloes of France’s bourgeois society and servant classes alike, Renoir’s numerous characters move into and out of the frame continually, giving shape to the director’s innovative strategy of playing his scenes “independent of the camera in all its real dramatic expense” (2). Consequently, the mise en scène – which is to say the space of the film – rids itself of its analogy to the frame, developing instead into a larger field in which “the action plays hide-and-seek with the camera” (3). With no drama to conceal therefore, 13 Lakes again does not seem an obvious choice to elucidate Bazin’s conceptualisation of the frame. Even so, an absence of dramatic action does not entail an absence of movement. Though Renoir’s characters are dramatically motivated to move in and out of view, thereby construing mise en scène’s independence from the frame, it is nonetheless the motion and not the motivation that gives shape to the space. Similarly, Benning’s film manifests movement, even if this motion does not facilitate traditional dramatic exposition. In the case of 13 Lakes, the movement depicted calls attention to the moment-to-moment transformation of the natural world. Whether it is the slow drift of cumulus clouds, raindrops falling on a tranquil mere, or a brisk wind sweeping across the surface of the water, the protean quality of the natural world is emphasized. And since the movement being depicted has nothing to do with authorial manipulation, it is motion which cannot be fully circumscribed within the confines of the frame. This is a transformation occurring continually, on- and off-screen. Nevertheless, these transformations are captured by a camera, commensurate with the editorial choices of the filmmaker (both in terms of what is shot and how it is depicted). It is, in other words, a work of art, however minimal it may be in its conception. Indeed, the particularities of its formal discourse will be examined in greater detail before returning to its pedagogic value in relation to Bazin’s conception of the frame. The most immediately apparent characteristic of James Benning’s film is surely its form: thirteen ten-minute static takes, which (save the leader between shots) comprise the entire visual track of the picture. Far from cursory, this detail accounts for the totality of Benning’s æsthetic. Everything that Benning says in 13 Lakes, he says using this formal language – along with a soundtrack recorded on-site, thought not necessarily concurrently with the image. Moreover, Benning, as has been noted, repeats the same basic framing in each of the thirteen segments, presenting the horizon-line in centre of the frame, dividing lake and sky into approximately equivalent fields. (To capture his subject in this manner, Benning placed the front legs of his tripod in the water and the rear one on the shoreline.) In this way, Benning does not vary his presentation of the film’s exceedingly uniform content. It goes without saying that most viewers are ill-prepared to view film according to this rubric: 13 Lakes is an extremely challenging work, not only because it dispenses with those traditional narrative modes most closely associated with theatre and the novel, but also for the exceptional patience and attenuation to detail that it demands of its viewers. As such, the experience of viewing 13 Lakes is closer to that of the plastic arts, and especially to painting, than it is to literature or the theatre. One looks at these landscapes as they would a painting of the same subject matter. Then again, the control of duration that is central to the medium’s ontology distinguishes it from this medium, reaffirming its association with theatre and especially music. Like these two, the experience of cinema is an experience of a specific duration. It possesses a rhythm by virtue of its design. In the case of painting, on the other hand, the experience of time is controlled by the viewer, not the artist. Among the effects of Benning’s particular strategy of showing landscapes over an extended duration is their facility to reveal aspects of natural phenomena that a more conventional representation would not. A prime example of this descriptive capacity manifest in Benning’s form is found in the film’s fourth segment, Lake Superior. Here, with temperatures hovering around zero Fahrenheit, a sheet of ice drifts gently over the incoming tide of Superior (the world’s largest freshwater lake, on the United States-Canada border). Normally, the representation of ice in the plastic arts calls attention to its mass and solidity – one need only think of the heft of German Romantic Caspar David Friedrich’s The Sea of Ice (c1823–5) or the impregnable surfaces in Bruegel the Elder’s The Hunters in the Snow (1565). In such representations, ice in effect is an extension of land mass to contrast with the void of the sea. Comparatively, the floating ice in the Superior segment intimates less a solid mass than it does a buoyant veil. The ice moves, which of course is a phenomenon that painting is incapable of representing. Then again, a shorter depiction of this subject (in something like a cutaway) would risk obscuring the image’s tactility, which is built up over time. Without the segment’s duration, the impression of buoyancy and the sense of weightlessness would not emerge. Indeed, Benning’s excess spawns a musicality – manifested in the rhythm of landscape – that affects the viewer supra-emotionally. In this, Benning shows his debt to filmmakers ranging from Andy Warhol and Michael Snow – Benning specifically cites Wavelength (Snow, 1966–7) as a source for 13 Lakes – to Michelangelo Antonioni, Andrei Tarkovsky and Abbas Kiarostami (who made his own landscape picture in 2004, Five, which all the same departs from Benning’s as it calls attention to its own formal illusion). If Benning shares their languid sense of rhythm, indeed, it would seem to be demanded not only by his subject matter, but further by what the director intends to accomplish in the film. Specifically, Benning’s stated purpose in 13 Lakes is to make a film that assists his viewers in becoming artists. Again, the temporal dimension of the work facilitates this strategy as the extended duration provides the viewer with the opportunity to decipher small changes and fluctuations in the natural world. In other words, it impels the viewer to look and listen with greater sensitivity, which importantly mimics the name of a class he teaches to young artists at the California Institute of the Arts, “Looking and Listening”. Both represent the same programme of honing the sensorial acumen of would-be artists. Ultimately, 13 Lakes and his class both attest to the same belief: that being an artist, especially in the cinema, is first a matter of being sensitive to the surrounding world. To see and to hear are necessary preconditions of being a successful artist. Speaking of success, there is no filmmaker working today with a greater reputation than Iranian master Abbas Kiarostami. Like Benning, Kiarostami is another filmmaker working on a similar wavelength, combining a patient observation of landscape with specific pedagogic programme that reinvests a Bazinian engagement of reality with post-Nouvelle Vague formalist preoccupations. If Abbas Kiarostami is thus the most radical re-interpreter of film form of his generation, Benning is a quiet, unassuming investigator of filmic ontology. Both, however, show a decided interest in the nature of the frame, even if Kiarostami’s is a systematic reappraisal of Bazinian thought, while Benning’s is perhaps an unintended echo of the same theoretical model. 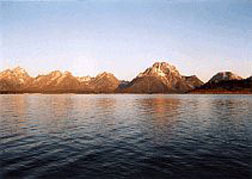 In the Lake Iliamna (Alaska) segment, the contemplation of the film’s subject is replaced with a consideration of the medium itself. As was stated at the outset, 13 Lakes facilitates a Bazinian reading of the picture, understanding the screen not as presenting a rectangular fragment of reality, but rather as a “mask whose function is no less to hide reality than it is to reveal it”. Again, the mise en scène is not limited to what is captured on-screen, but rather spills into an indeterminate space existing just beyond the limits of the frame. It is the space of the art, and yet possesses no precise physical presence of its own. It is conceptual rather than material and, at the same time, its material existence cannot be denied, as long as what is represented on camera is a photographic record of the real world. Thus, while the mise en scène is a composite of on- and off-camera spaces, the frame delineating the two becomes itself a narrational tool, subject to the manipulations of the artist. Assuming this explanation of the narrational capacity of the frame, there would again seem few films less corroborative of Bazin’s point than a non-narrative, post-human motion picture composed entirely of static long takes. Then again, Benning’s is not a film devoid of movement, even if the change depicted is that inherent in nature and not actor movement in and out of the frame (as in the Renoir film). In the Alaskan segment, a strong gust of wind continually blows snow onto the water from a position behind the camera. (Benning tells of being caked in a couple of inches of snow during the course of the filming.) As a consequence of this motion from the space behind the camera to that before it, the viewer becomes aware not only the lateral space spoken of by Bazin, but additionally to a spatial depth in which the camera exists not on the edge of a conceptual universe but rather in the midst of a much larger world. It is not the camera or the characters which are in motion, but, instead, it is the cosmos. The static camera is a passive observer of this perpetual flux. Indeed, the convergence of a static camera and movement in depth also provides the film with one of its stranger allusions, and certainly its most unexpected lesson. As the story goes, when the Brothers Lumière first screened L’Arrivée d’un train à la Ciotat (1895) in a Parisian theatre, the unacclimated audience rushed for the exits, believing that the train was barrelling headlong in their direction. In other words, the crowd believed that they were seeing a real train coming towards them and assumed that the screen was an aperture opening up onto a reality where the train was coming towards them. Whether or not this account is correct is of little importance, conceptually. In either case, what was being forwarded was a description of the frame as a mask, a forerunner to Bazin’s conceit. If indeed the frame opened up onto another reality, then the four walls of the theatre acted to conceal this space every bit as much as the camera disclosed a congruent world. That is, the space of the screen is only a fragment of the space present at the moment of the action – whether the screen is an aperture opening on to another reality or a plastic representation of a space at and over a particular time. In the same way, the motion through Benning’s camera gives the impression that the theatre is again masking the viewer from a reality extant beyond the four walls of the theatre. While no contemporary viewer would succumb to the same panic ascribed to cinema’s first patrons, the Lake Iliamna segment fosters an understanding of the medium equivalent to the one possessed by these earliest viewers. One could imagine the theatre being present amidst the reality being depicted on-screen, on the edge of Iliamna, with the space of the screen again serving as an opening looking onto this abutting world. Of course, the wisdom in this conceptualisation of the screen can be easily lost in its self-evident naiveté. The point to be gleaned is that the camera itself exists within a space that again Benning’s film calls attention to in the noted sequence. This acknowledgment is essential to cinema’s contingent relationship to reality, which indeed exists at the core of the Bazinian thesis. It is not simply that photography-based cinema depicts reality through the act of filming, but moreover that the spatial presence of the camera (in imprinting reality) requires its situation in space. It is up to the filmmakers, consequently, to determine whether or not they will draw attention to the space beyond the frame. Renoir and Benning are both successful in doing so, even if the means by which they achieve this effect are decidedly different. It is important, likewise, to remember that the world beyond the frame is an essential component to the artist’s experience of the filmmaking process. Again during the post-film wrap-up, another of the film’s spectators asked a question which compelled Benning to respond approvingly that he hoped his viewers would think about his experience of making the film. His point, it would seem, is pedagogic: the process of filmmaking, and thus its consequent form, is influenced by the artist’s experience of a particular time and place. Cinema not only renders space, but given its photographic ontology, is actualised within a greater, contingent space. To summarize, then, 13 Lakes’ purpose is didactic: by replicating the artist’s own careful observation of the natural world, it seeks to assist its audience in becoming artists in their own right. Moreover, Benning offers surprising insight into the spatial nature of his medium, simply by anchoring his camera firmly in place. In short, the form of Benning’s film directly yields its content. Then again, Benning’s film is not entirely without formal precedent: Benning remains a structuralist in a time well after that movement’s cultural ebb. Yet, if Benning’s work is mildly anachronistic in this sense, it remains very much a product of its moment in another: its relation to the environmentalist movement. However, as counterintuitive as it might seem initially, 13 Lakes is defiantly non-environmentalist in its ethos. In fact, in one of the most telling moments of the post-film wrap-up, one viewer began her question by stating that she knows that the filmmaker is an environmentalist. To this, Benning quickly rejoined, glibly, that he is in fact not an environmentalist, as should be evident by the ten thousand miles he drove in the making of the film. 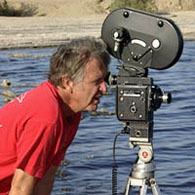 While he later conceded that one of the points of the film is the condition of the lakes at the moment of filming, he held that he is an outsider to the movement. The point being made by Benning was not that he is unconcerned with nature, but rather that he does not agree with all of environmentalism’s tenets. More to the point, Benning does not share certain presuppositions of the environmentalist movement. Tellingly, Benning in a further elaboration of his divergence from this school of thought averred that the lakes themselves would be around long after the rest of us have gone. The implication of this observation, certainly, distinguishes the director from environmentalist orthodoxy: to Benning, the environment is resilient, whereas it is its frailty that instructs environmentalist orthodoxy. From this presupposition, environmentalism derives its governing thesis: that human malevolence has produced the ecologically-fallen condition in which planet Earth finds itself. Climactic changes, for example, are no long ascribed to the same sort of long-range environmental changes that brought this planet out of its most recent ice age, but rather speak to an instance of human transgression in the stewardship of the environment. Likewise, when evidence seems to contradict this basic belief – such as with the by now well-documented growth of the Antarctic ice sheet since the early 1990s (http://www.nature.com/news/2005/050516/full/050516-10.html) – environmentalism more often than not has opted to cling to prevailing articles of faith rather than follow new scientific discoveries which it purports to represent. 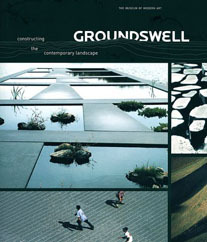 Indeed, Crichton’s thesis seems all-the-more compelling in light of a recent exhibition at New York’s Museum of Modern Art entitled Groundswell: Constructing the Contemporary Landscape. This presentation of 23 (mostly) urban landscape designs showcased an interest in reclaiming an environment ravaged by two-plus centuries of industrialization. However, as if to assure their continued educational value, many of these spaces feature the skeletons of their former uses. It is not simply a matter of a park replacing a factory, as is the case of the Duisburg-Nord Landscape Park in Germany. Instead, the park commingles with its former usage, as if to highlight the inexorable damage done by its industrial use. The Duisburg park, like so many of the others featured in this revue, underscore the religious dimension of the movement that they instantiate: in this case, it would seem that the designers are calling for humankind to be contrite. In others, such as with the reconstituted Fresh Kills Landfill in suburban New Jersey, the refigured landscape is the act of contrition itself, making cursory amends for the sins of our fathers, even if the scars of our transgressions remain. Certainly, this new art movement deserves thusly to be recognized as the dominant religious art of our time. These newly regenerate public spaces are the Gothic cathedrals of the present, welcoming a devout atheistic public. In film, environmentalist art has likewise asserted its pre-eminence, be it in the late work of Japanese legend Akira Kurosawa (A Rhapsody in August, 1990) or in the pictures of Hollywood titan Steven Spielberg (A. I. – Artificial Intelligence, 2001), to say nothing of the countless catastrophe pictures and dystopian fantasies that continue to grace the screen with metronomic regularity each summer. And then there is Benning’s film about thirteen lakes, which is as far removed from the Hollywood system as it is from environmental orthodoxy. Perhaps there is no better way to conclude than to be reminded of the film’s simplicity and to consider the film’s nonconformity, both in terms of its form and in its content. Whether it is its opposition to traditional narrative structures or to the environmentalist gospel, 13 Lakes remains enmeshed with a dialogue specific to its particular time. The subject of the film might be eternal, but its implications are very timely. André Bazin, “The French Renoir”, Jean Renoir, p. 89. Michael J. Anderson is a joint PhD candidate in Film Studies and the History of Art at Yale University, where he is doing his dissertation on the early films of Howard Hawks. In the past, he has written Cinémathèque Annotations on Hawks’ Tiger Shark and Frank Borzage’s The Mortal Storm. He is also the proprietor of the film weblogs Tativille and Ten Best Films.